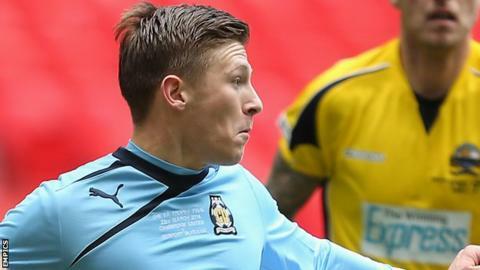 Cambridge won to strengthen their position in the play-off places and worsen Southport's relegation fears. Jason Walker had the Conference Premier strugglers in front, heading in Steven Boothman's cross. But the U's replied from the spot when Toto Nsiala brought down Luke Berry, who converted from 12 yards. And Richard Money's side went ahead as Luke Chadwick finished from an Andy Pugh pass, with the latter completing the scoring with a superb finish. With league leaders Luton Town beating Aldershot, the U's remain 13 points adrift of automatic promotion, but are 10 points above the play-off cut-off point. The Shots' defeat and a loss for Hereford means Southport are still four points above the relegation zone. "Well it was a win and as I said on a number of occasions, when you don't play particularly well it's important that you win and thankfully we've done that. "We came out at the start of the first half thinking that we were still on the pitch from Tuesday night and forgot that we've got to earn the right to play. But we do show a good resilience and an ability to get back into it. "Sometimes you need people to force you to play it in behind and force you to play forward and those two (Pugh and Ashley Chambers) came on and played with some real urgency. They were a real threat and a real problem for Southport." Match ends, Cambridge United 3, Southport 1. Second Half ends, Cambridge United 3, Southport 1. Attempt blocked. Liam Hughes (Cambridge United) right footed shot from the right side of the box is blocked. Vinny Mukendi (Southport) hits the bar with a right footed shot from the right side of the box. Attempt saved. Jason Walker (Southport) left footed shot from the centre of the box is saved. Attempt blocked. Jason Walker (Southport) left footed shot from the centre of the box is blocked. Attempt missed. Ryan Donaldson (Cambridge United) right footed shot from outside the box is too high. Attempt saved. John O'Sullivan (Southport) right footed shot from outside the box is saved. Osayamen Osawe (Southport) is shown the yellow card for a bad foul. Foul by Osayamen Osawe (Southport). Kevin Roberts (Cambridge United) wins a free kick. Ryan Donaldson (Cambridge United) wins a free kick. Hand ball by David Fitzpatrick (Southport). Attempt missed. Luke Chadwick (Cambridge United) right footed shot from the centre of the box is too high. Attempt missed. Scott Brown (Southport) header from the centre of the box is too high. Scott Brown (Southport) is shown the yellow card for a bad foul. Foul by Scott Brown (Southport). Attempt missed. Andy Pugh (Cambridge United) right footed shot from outside the box misses to the right. Attempt missed. Karl Ledsham (Southport) right footed shot from outside the box misses to the right. Attempt saved. Jason Walker (Southport) left footed shot from outside the box is saved. Goal! Cambridge United 3, Southport 1. Andy Pugh (Cambridge United) left footed shot from the centre of the box to the high centre of the goal. Assisted by Greg Taylor. Attempt missed. Ashley Chambers (Cambridge United) left footed shot from outside the box is too high. Foul by Andy Pugh (Cambridge United). Substitution, Southport. Vinny Mukendi replaces Danny Hattersley. Substitution, Southport. Osayamen Osawe replaces Steven Boothman. Substitution, Cambridge United. Liam Hughes replaces Luke Berry. Substitution, Cambridge United. Ashley Chambers replaces Matthew Barnes-Homer.